The Philippines becomes an unincorporated territory of the United States and, later, a U.S. Commonwealth (until 1946). ↑ While there are many estimates for civilian deaths, with some even going well over a million for the war, modern historians generally place the death toll between 200,000 and 1,000,000; see "Casualties". 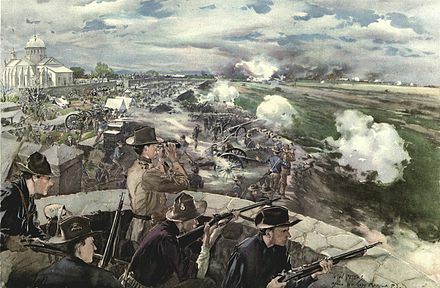 The Battle of Manila, the first and largest battle of the Philippine–American War, was fought on February 4–5, 1899, between 19,000 American soldiers and 15,000 Filipino armed militiamen. 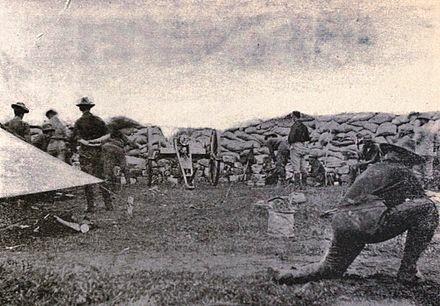 Armed conflict broke out when American troops, under orders to turn away insurgents from their encampment, fired upon an encroaching group of Filipinos. Philippine President Emilio Aguinaldo attempted to broker a ceasefire, but American General Elwell Stephen Otis rejected it and fighting escalated the next day. It ended in an American victory, although minor skirmishes continued for several days afterward. 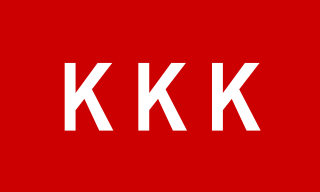 The Kataas-taasan, Kagalang-galangang, Katipunan ng mga Anak ng Bayan, also known as Katipunan or KKK, was a Philippine revolutionary society founded by anti-Spanish colonialism Filipinos in Manila in 1892; its primary goal was to gain independence from Spain through a revolution. 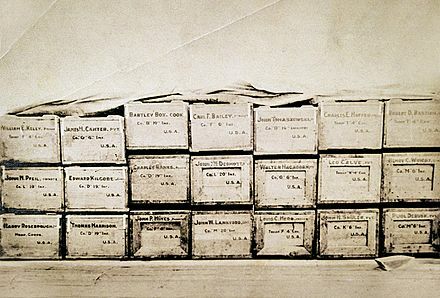 Documents discovered in the 21st century suggest that the society had been organized as early as January 1892 but may not have become active until July 7 of the same year; that was the date that Filipino writer José Rizal was to be banished to Dapitan. Founded by Filipino patriots Andrés Bonifacio, Teodoro Plata, Ladislao Diwa, Darilyo Valino, Rulfo Guia, Dano Belica, Tiburcio Liamson, and Gabrino Manzanero, the Katipunan was a secret organization until it was discovered in 1896. 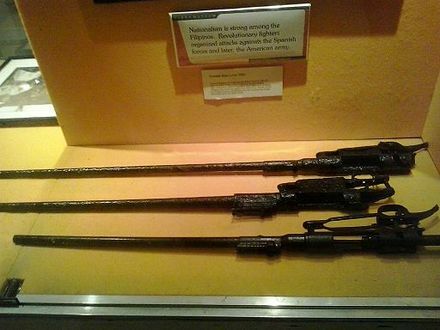 This discovery led to the outbreak of the Philippine Revolution. Macario Sakay y de León was a Filipino general who took part in the 1896 Philippine Revolution against the Spanish Empire and in the Philippine-American War. After the war was declared over by the United States in 1902, Sakay continued resistance by leading guerrilla raids. The following year he became President of the Republic of Katagalugan. The war resulted in the deaths of at least 200,000 Filipino civilians, mostly due to famine and disease. Some estimates for total civilian dead reach up to a million. The war, and especially the following occupation by the U.S., changed the culture of the islands, leading to the disestablishment of the Catholic Church in the Philippines as a state religion, and the introduction of English to the islands as the primary language of government, education, business, industry, and, in future decades, among upper-class families and educated individuals. The Catholic Church in the Philippines is part of the worldwide Catholic Church, under the spiritual direction of the Pope. The Philippines is one of the two nations in Asia having a substantial portion of the population professing the Catholic faith, along with East Timor, and has the third largest Catholic population in the world after Brazil and Mexico. The episcopal conference responsible in governing the faith is the Catholic Bishops' Conference of the Philippines. Philippine English is any variety of English native to the Philippines, including those used by the media and the vast majority of educated Filipinos. English is taught in schools as one of the two official languages of the country, the other being Filipino (Tagalog). Due to the strongly bilingual and multilingual nature of the Philippines, code-switching such as Taglish and Bislish is prevalent across domains from the informal to business and mass media. In 1902, the United States Congress passed the Philippine Organic Act, which provided for the creation of the Philippine Assembly, with members to be elected by Filipino males (women did not have the vote until after the 1937 suffrage plebiscite  ). This act was superseded by the 1916 Jones Act (Philippine Autonomy Act), which contained the first formal and official declaration of the United States government's commitment to eventually grant independence to the Philippines. The 1934 Tydings–McDuffie Act (Philippine Independence Act) created the Commonwealth of the Philippines the following year, increasing self-governance in advance of independence, and established a process towards full Philippine independence (originally scheduled for 1944, but interrupted and delayed by World War II). The United States granted independence in 1946, following World War II and the Japanese occupation of the Philippines, through the Treaty of Manila. The Philippine Organic Act was a basic law for the Insular Government that was enacted by the United States Congress on July 1, 1902. It is also known as the Philippine Bill of 1902 and the Cooper Act, after its author Henry A. Cooper. The approval of the act coincided with the official end of the Philippine–American War. The Philippine Assembly was the lower house of the Philippines from 1907 to 1916. Along with an upper house, it formed the bicameral Philippine Legislature during part of the American Colonial Period. 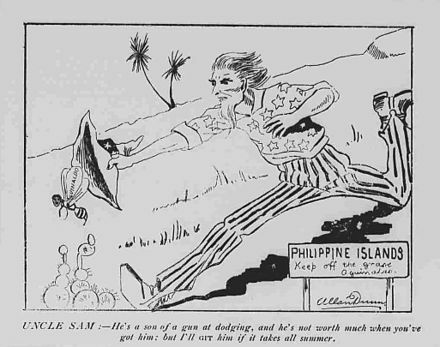 Personifying the United States, Uncle Sam chases a bee representing Emilio Aguinaldo. Andrés Bonifacio was a warehouseman and clerk from Manila. On July 7, 1892, he established the Katipunan—a revolutionary organization formed to gain independence from Spanish colonial rule by armed revolt. Fighters in Cavite province won early victories. One of the most influential and popular leaders from Cavite was Emilio Aguinaldo, mayor of Cavite El Viejo (modern-day Kawit), who gained control of much of the eastern portion of Cavite province. 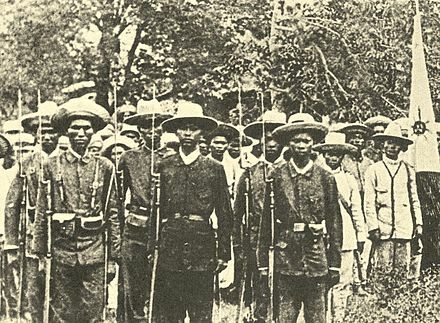 Eventually, Aguinaldo and his faction gained control of the leadership of the Katipunan movement. Andrés Bonifacio y de Castro was a Filipino revolutionary leader and the president of the Tagalog Republic. He is often called "The Father of the Philippine Revolution. ". He was one of the founders and later Supremo of the Kataas-taasan, Kagalanggalangang Katipunan ng mga Anak ng Bayan or more commonly known as "Katipunan", a movement which sought the independence of the Philippines from Spanish colonial rule and started the Philippine Revolution. He is considered a national hero of the Philippines. A warehouseman can be someone who works in a warehouse, usually delivering goods for sale or storage, or, in older usage, someone who owns a warehouse and sells goods directly from it or from a shop fronting onto the warehouse. A clerk is a white-collar worker who conducts general office tasks, or a worker who performs similar sales-related tasks in a retail environment. The responsibilities of clerical workers commonly include record keeping, filing, staffing service counters, screening solicitors, and other administrative tasks. The Tejeros Convention was the meeting held on March 22, 1897 between the Magdiwang and Magdalo factions of the Katipunan at San Francisco de Malabon, Cavite. These are the first presidential and vice presidential elections in Philippine history, although only the Katipuneros were able to take part, and not the general populace. Less than three months after Aguinaldo's return, the Philippine Revolutionary Army had conquered nearly all of the Philippines. With the exception of Manila, which was surrounded by revolutionary forces some 12,000 strong, the Filipinos controlled the Philippines. Aguinaldo turned over 15,000 Spanish prisoners to the Americans, offering them valuable intelligence. [ citation needed ] Aguinaldo declared independence at his house in Cavite El Viejo on June 12, 1898. On April 22, 1898, while in exile, Aguinaldo had a private meeting in Singapore with United States Consul E. Spencer Pratt, after which he decided to again take up the mantle of leadership in the Philippine Revolution. According to Aguinaldo, Pratt had communicated with Commodore George Dewey (commander of the Asiatic Squadron of the United States Navy) by telegram, and passed assurances from Dewey to Aguinaldo that the United States would recognize the independence of the Philippines under the protection of the United States Navy. Pratt reportedly stated that there was no necessity for entering into a formal written agreement because the word of the Admiral and of the United States Consul were equivalent to the official word of the United States government. With these assurances, Aguinaldo agreed to return to the Philippines. On December 21, 1898, President William McKinley issued a Proclamation of Benevolent assimilation. Major General Elwell Stephen Otis—who was appointed Military Governor of the Philippines at that time—delayed its publication. On January 4, 1899, General Otis published an amended version edited so as not to convey the meanings of the terms "sovereignty", "protection", and "right of cessation", which were present in the original version. However, Brigadier General Marcus Miller—then in Iloilo City and unaware that the altered version had been published by Otis—passed a copy of the original proclamation to a Filipino official there. 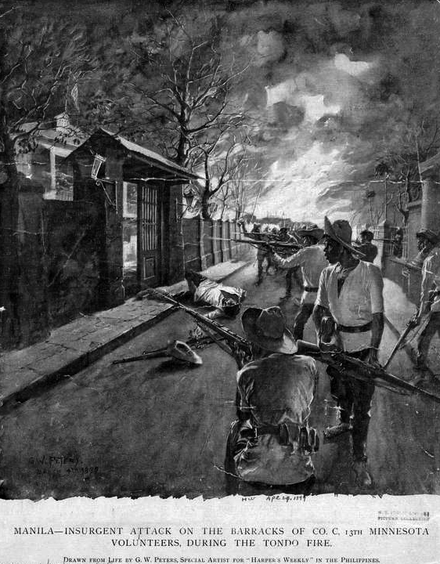 The Battle of Caloocan, February 10, 1899. Major General Arthur MacArthur with binoculars. 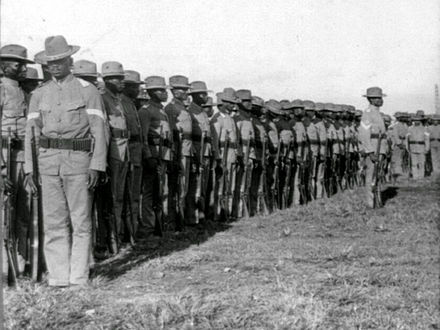 The 24th U.S. Infantry (primarily made up of African-American soldiers) at drill. Camp Walker, Cebu, 1902. For most of 1899, the revolutionary leadership had viewed guerrilla warfare strategically only as a tactical option of final recourse, not as a means of operation which better suited their disadvantaged situation. On November 13, 1899, Emilio Aguinaldo decreed that guerrilla war would henceforth be the strategy. This made American occupation of the Philippine archipelago all the more difficult over the next few years. During the first four months of the guerrilla war, the Americans had nearly 500 casualties. The Philippine Army began staging bloody ambushes and raids, such as the guerrilla victories at Paye, Catubig, Makahambus, Pulang Lupa, Balangiga and Mabitac. At first, it seemed that the Filipinos might be able to fight the Americans to a stalemate and force them to withdraw. President McKinley considered withdrawal when the guerrilla raids began. The Philippine Army continued suffering defeats from the better armed United States Army during the conventional warfare phase, forcing Aguinaldo to continually change his base of operations throughout the course of the war. On April 1, 1901, at the Malacañan Palace in Manila, Aguinaldo swore an oath accepting the authority of the United States over the Philippines and pledging his allegiance to the American government. On April 19, he issued a Proclamation of Formal Surrender to the United States, telling his followers to lay down their weapons and give up the fight. Enraged by a guerrilla massacre of U.S. troops on the Island of Samar, General Jacob H. Smith retaliated by carrying out an indiscriminate attack upon its inhabitants. His order "KILL EVERY ONE OVER TEN" became a caption in the New York Journal cartoon on May 5, 1902. The Old Glory draped an American shield on which a vulture replaced the bald eagle. The bottom caption exclaimed, "Criminals Because They Were Born Ten Years Before We Took the Philippines". This was published in the New York Journal-American , May 5, 1902. Smith was eventually court-martialed by the American military and forced to retire. General Otis' investigation of the content of these letters consisted of sending a copy of them to the author's superior and having him force the author to write a retraction. [ citation needed ] When a soldier refused to do so, as Private Charles Brenner of the Kansas regiment did, he was court-martialed. In the case of Private Brenner, the charge was "for writing and conniving at the publication of an article which...contains willful falsehoods concerning himself and a false charge against Captain Bishop." Not all such letters that discussed atrocities were intended to criticize General Otis or American actions. Many portrayed U.S. actions as the result of Filipino provocation and thus entirely justified. Following Aguinaldo's capture by the Americans on March 23, 1901, Miguel Malvar assumed command of the Philippine revolutionary forces. Batangas and Laguna provinces were the main focus of Malvar's forces at this point in the war, and they continued to employ guerrilla warfare tactics. Vicente Lukbán remained active as Guerilla commander in Samar. 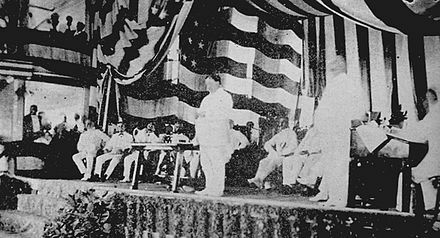 In the report that they issued to McKinley the following year, the commissioners acknowledged Filipino aspirations for independence; they declared, however, that the Philippines was not ready for it. 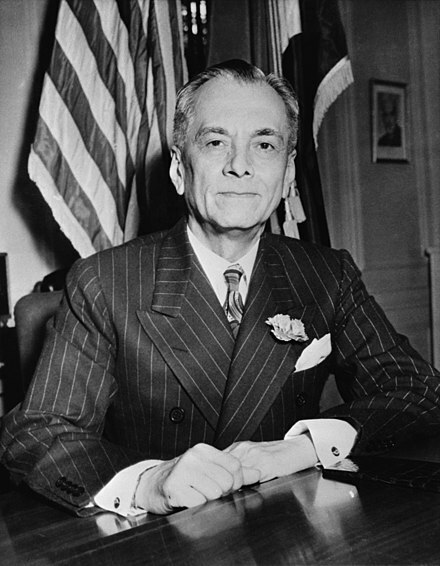 Specific recommendations included the establishment of civilian control over Manila (Otis would have veto power over the city's government), creation of civilian government as rapidly as possible, especially in areas already declared "pacified" (the American chief executive in the islands at that time was the military governor),  including the establishment of a bicameral legislature, autonomous governments on the provincial and municipal levels, and a system of free public elementary schools. U.S. Army Captain Matthew Arlington Batson formed the Macabebe Scouts  as a native guerrilla force to fight the insurgency. 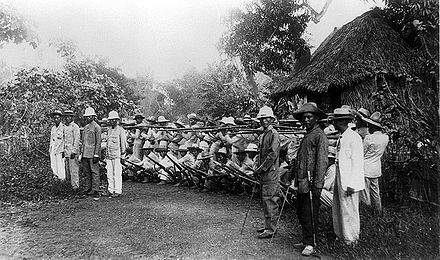 After military rule was terminated on July 4, 1902,  the Philippine Constabulary was established as an archipelago-wide police force to control brigandage and deal with the remnants of the insurgent movement. 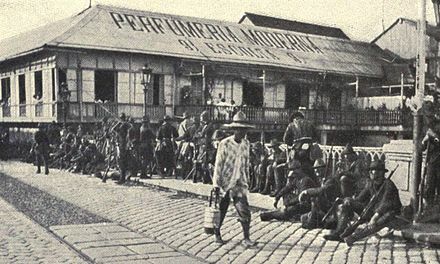 The Philippine Constabulary gradually took over the responsibility for suppressing guerrilla and bandit activities from United States Army units. 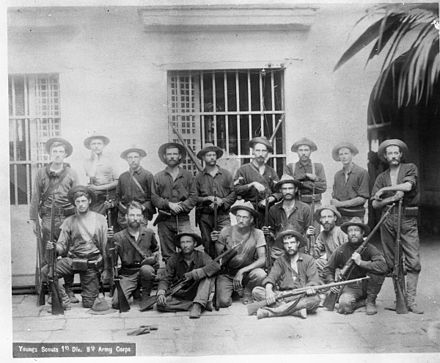 Remnants of the Katipunan and other resistance groups remained active fighting the United States military or Philippine Constabulary for nearly a decade after the official end of the war. After the close of the war, however, Governor General Taft preferred to rely on the Philippine Constabulary and to treat the Irreconcilables as a law enforcement concern rather than a military concern requiring the involvement of the American army. The Jones Act, passed by the U.S. Congress in 1916 to serve as the new organic law in the Philippines, promised eventual independence and instituted an elected Philippine senate. The Tydings–McDuffie Act (officially the Philippine Independence Act; Public Law 73-127) approved on March 24, 1934, provided for self-government of the Philippines and for Filipino independence (from the United States) after a period of ten years. World War II intervened, bringing the Japanese occupation between 1941 and 1945. In 1946, the Treaty of Manila (1946) between the governments of the U.S. and the Republic of the Philippines provided for the recognition of the independence of the Republic of the Philippines and the relinquishment of American sovereignty over the Philippine Islands. 1 2 3 4 5 Worcester 1914, p. 293. 1 2 "Diplomatic relations between the Philippines and Japan". Diplomatic relations. Manila: Official Gazette of the Republic of the Philippines. 2016. Retrieved December 25, 2016. 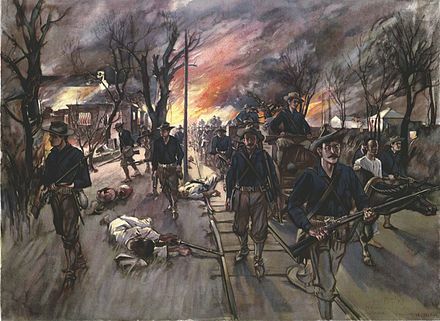 On February 4, 1899, the Philippine-American War broke out. A handful of Japanese shishi, or ultranationalists, fought alongside President Aguinaldo's army. 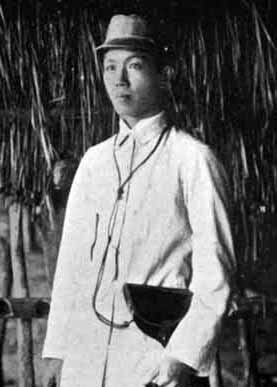 They landed in Manila, led by Captain Hara Tei and joined Aguinaldo's forces in Bataan. ↑ "Historian Paul Kramer revisits the Philippine–American War". The JHU Gazette. Baltimore, Maryland: Johns Hopkins University Press. 35 (29). April 10, 2006. Retrieved December 25, 2016. 1 2 Karnow 1989, p. 194. ↑ Hack & Rettig 2006, p. 172. 1 2 3 Ramsey 2007, p. 103. ↑ Smallman-Raynor, Matthew; Cliff, Andrew D. (1998). "The Philippines insurrection and the 1902–4 cholera epidemic: Part I—Epidemiological diffusion processes in war". Journal of Historical Geography. 24 (1): 69–89. doi:10.1006/jhge.1997.0077. ↑ "Philippines Background Note". U.S. Bilateral Relations Fact Sheets: Background Notes. Washington, D.C.: United States Department of State. 2004. Retrieved December 25, 2016. ↑ Battjes 2011, p. 74. ↑ Silbey 2008, p. 15. ↑ "The Philippine-American War, 1899–1902". Office of the Historian, U.S. Department of State. Retrieved November 19, 2017. ↑ Kalaw 1927, pp. 199–200. ↑ Paterno, Pedro Alejandro (June 2, 1899). "Pedro Paterno's Proclamation of War". The Philippine-American War Documents. San Pablo City, Philippines: MSC Institute of Technology, Inc. Retrieved December 25, 2016. 1 2 3 Agoncillo 1990, pp. 247–297. ↑ Tucker, Spencer (2009). The Encyclopedia of the Spanish-American and Philippine-American Wars: A Political, Social, and Military History. ABC-CLIO. p. 478. ISBN 9781851099511. ↑ "The Road to Women's Suffrage in the Philippines". Bayanihan News, Australia. August 8, 2014. 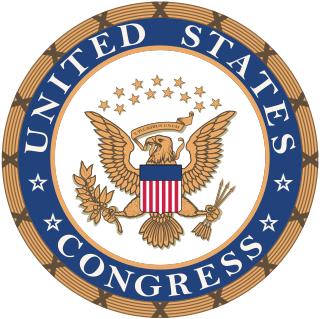 ↑ United States Congress (August 29, 1916). "Philippine Autonomy Act". thecorpusjuris.com. ↑ In the "Instructions of the President to the Philippine Commission Archived February 27, 2009, at the Wayback Machine " dated April 7, 1900, President William McKinley reiterated the intentions of the United States Government to establish and organize governments, essentially popular in their form, in the municipal and provincial administrative divisions of the Philippine Islands. However, there was no official mention of any declaration of Philippine Independence. ↑ Agoncillo 1990, pp. 180–181. ↑ "Emilio Aguinaldo". Presidential Museam and Library. Malacañan Palace. ↑ "Proclamation No. 1231, s. 2016". February 29, 2016. General Emilio Aguinaldo, the first President of the Republic of the Philippines"
↑ Halstead 1898, p. 177. ↑ Aguinaldo 1899, p. 4. ↑ Constantino 1975, p. 192. ↑ Miller 1982, p. 35. ↑ Ocampo, Ambeth R. (January 7, 2005). "The first Philippine novel". Philippine Daily Inquirer. Manila. 1 2 Brands 1992, p. 46. ↑ Steinberg, David Joel (1972). "An Ambiguous Legacy: Years at War in the Philippines". Pacific Affairs . 45 (2): 165–190. doi:10.2307/2755549. JSTOR 2755549. ↑ Aguinaldo 1899, p. 5. ↑ Aguinaldo 1899, pp. 12–13. ↑ Aguinaldo 1899, pp. 15–16. ↑ "Treaty of Peace Between the United States and Spain; December 10, 1898". The Avalon Project . New Haven, Connecticut: Lillian Goldman Law Library, Yale Law School. 2008. Retrieved December 25, 2016. ↑ Jaycox 2005, p. 130. ↑ Agoncillo 1990, pp. 199–212. ↑ Aguinaldo 1899, pp. 10–12. ↑ Aguinaldo 1899, p. 10. ↑ "Spencer-Pratt and Aguinaldo" (PDF). The New York Times. New York City. August 26, 1899. ↑ Agoncillo 1990, pp. 213–214. ↑ Agoncillo 1990, p. 196. ↑ "Introduction". The World of 1898: The Spanish–American War. Washington, D.C.: Hispanic Division, United States Library of Congress. 2011. Retrieved December 25, 2016. ↑ Seekins, Donald M. (1991). "Outbreak of War, 1898". In Dolan, Ronald E. (ed.). Philippines: A Country Study. Washington, D.C.: United States Library of Congress. ↑ The text of the amended version published by General Otis is quoted in its entirety in José Roca de Togores y Saravia; Remigio Garcia; National Historical Institute (Philippines) (2003). Blockade and siege of Manila. National Historical Institute. pp. 148–150. ISBN 978-971-538-167-3. ; See also s:Letter from E.S. Otis to the inhabitants of the Philippine Islands, January 4, 1899. ↑ Agoncillo 1990, pp. 214–215. ↑ Agoncillo 1990, p. 215. 1 2 Agoncillo 1990, p. 216. 1 2 Chaput, Donald (1980). "Private William W Grayson's war in the Philippines, 1899" (PDF). Nebraska History. 61: 355–66. ↑ "National Historical Institute Board Resolution No. 7, s. 2003". Manila: National Historical Commission of the Philippines. Retrieved December 25, 2016. ↑ Palafox, Quennie Ann J. (September 6, 2012). "Betrayal of Trust – The San Juan Del Monte Bridge Incident". Manila: National Historic Commission of the Philippines. Retrieved December 25, 2016. 1 2 "The week". The Nation. Vol. 68 no. 1766. May 4, 1899. p. 323. ↑ Agoncillo 1990, p. 217. ↑ Miller 1982, p. 2. ↑ Special Dispatch (February 14, 1899). "Iloilo is taken and no American loses his life". San Francisco Call. 85 (76). San Francisco. p. 1. ↑ Lone 2007, p. 56. 1 2 Worcester 1914, p. 285. 1 2 Worcester 1914, pp. 290–293. ↑ Lone 2007, p. 58. ↑ Miller 1982, pp. 63–66. 1 2 3 Miller 1982, p. 89. 1 2 Miller 1982, pp. 92–93. ↑ Miller 1982, p. 93. ↑ San Francisco Call February 23, March 30, 31, 1899. ↑ Miller 1982, pp. 93–94. ↑ Miller 1982, p. 94. ↑ Linn 2000, pp. 186–187, 362 (notes 5 and 6). ↑ Sexton 1939, p. 237. ↑ Pershing, John J. (2013). My Life Before the World War, 1860—1917: A Memoir. University Press of Kentucky. p. 547. ISBN 0-8131-4199-0. ↑ Linn, Brian McAllister (2000). The U.S. Army and Counterinsurgency in the Philippine War, 1899–1902. UNC Press Books. pp. 23–24. ISBN 978-0-8078-4948-4. ↑ Birtle 1998, pp. 116–118. ↑ Keenan 2001, pp. 211–212. ↑ Linn 2000, p. 175. ↑ Aguinaldo y Famy, Don Emilio (April 19, 1901). "Aguinaldo's Proclamation of Formal Surrender to the United States". The Philippine-American War Documents. Pasig City, Philippines: Kabayan Central Net Works Inc. Retrieved December 25, 2016. ↑ Brands 1992, p. 59. ↑ Tucker 2009, p. 217. 1 2 Macapagal Arroyo, Gloria (April 9, 2002). "Proclamation No. 173. s. 2002". Manila: Official Gazette of the Republic of the Philippines. Archived from the original on December 28, 2016. Retrieved December 25, 2016. ↑ Tucker 2009, pp. 477–478. 1 2 Bruno, Thomas A (2011). "The Violent End of Insurgency on Samar, 1901–1902" (PDF). Army History. 79 (Spring): 30–46. 1 2 3 "Philippines: United States Rule". Washington, D.C.: United States Library of Congress. Retrieved December 25, 2016. 1 2 3 "The Philippine Bill (enacted July 1, 1902)". ChanRobles Virtual Law Library: Philippine Laws, Statutes & Codes. Manila: ChanRobles & Associates Law Firm. 2016. Retrieved December 25, 2016. ↑ "General amnesty for the Filipinos; proclamation issued by the President" (PDF). The New York Times. New York City. July 4, 1902. ↑ "Speech of President Arroyo during the Commemoration of the Centennial Celebration of the end of the Philippine-American War April 16, 2002". Official Gazette. Government of the Philippines. ↑ Boot 2014, p. 125. ↑ Rummel, Rudolph J. (1998). Statistics of Democide: Genocide and Mass Murder Since 1900. LIT Verlag Münster. p. 201. ISBN 978-3-8258-4010-5. ↑ "Statistics of American Genocide and Mass Murder". www.hawaii.edu. ↑ The Philippine-American War, 1899–1902 Archived October 19, 2016, at the Wayback Machine , U.S. State Department, Office of the Historian. ↑ Bob Couttie, Philippine Genocide – The Numbers Don't Add Up. ↑ Zinn 2003, p. 230. ↑ Coulter, Clinton R. (August 1, 1899). "Our policy in the Philippines". San Francisco Call. 86 (62). San Francisco. p. 6. ↑ Miller 1982, p. 88. ↑ "President Retires Gen. Jacob H. Smith" (PDF). The New York Times. July 17, 1902. Retrieved March 30, 2008. ↑ Melshen, Paul. "Littleton Waller Tazewell Waller". Archived from the original on April 21, 2008. Retrieved March 30, 2008. ↑ Schirmer, Daniel B.; Shalom, Stephen Rosskamm (1987). The Philippines Reader: A History of Colonialism, Neocolonialism, Dictatorship, and Resistance. South End Press. p. 17. ISBN 978-0-89608-275-5. ↑ Linn 2000, p. 152. ↑ Francisco et al. 1999, p. 18. 1 2 Storey & Codman 1902, pp. 32, 64, 77–79, 89–95. ↑ Stuart Creighton Miller, Benevolent Assimilation: The American Conquest of the Philippines, 1899–1903, 1982 p.244. ↑ McLachlan 2012, p. 565. ↑ Storey & Codman 1902, pp. 44, 48–49, 61–62, 65, 67. ↑ Storey & Codman 1902, pp. 10, 38, 64, 95. ↑ Brody 2010, pp. 69–71. ↑ Bennett, James Gordon (February 21, 1899). "Aguinaldo's dusky demons in arms making war on those who aid the wounded". San Francisco Call. 85 (83). San Francisco. p. 1. ↑ Special Dispatch (May 29, 1899). "Treachery of natives of Negros: display a flag of truce and then fire upon landing party of Americans". San Francisco Call. 85 (180). San Francisco. p. 1. ↑ Oswald, Mark (2001). The "howling wilderness" courts-martial of 1902. Carlisle Barracks, Pennsylvania: United States Army War College. ↑ Boot 2014, p. 204. ↑ Miller 1982, p. 220. ↑ "Bob Couttie Archived October 17, 2015, at the Wayback Machine "
↑ Simmons 2003, p. 78. ↑ "The water cure described: discharged soldier tells Senate committee how and why the torture was inflicted" (PDF). The New York Times. New York City. May 4, 1902. ↑ Agoncillo 1990, pp. 227–231. ↑ Worcester 1914, p. 384. ↑ "There was no necessity for war in the Philippine islands". San Francisco Call. 86 (106). San Francisco. September 14, 1899. p. 1. 1 2 Miller 1982, p. 132. ↑ Golay 2004, pp. 49–50. ↑ Golay 2004, p. 50. ↑ Schurman et al. 1900, p. 183. ↑ Kalaw 1927, pp. 452–459 (Appendix F). ↑ Twain, Mark (October 6, 1900). "Mark Twain, the greatest American humorist, returning home". New York World. New York City. ↑ Rohter, Larry (July 9, 2010). "Dead for a century, Twain says what he meant". The New York Times. New York City. ↑ Buencamino, Felipe (1902). Statement before the Committee on Insular Affairs on conditions in the Philippine islands. Washington, D.C.: United States Government Publishing Office. p. 64. ↑ "NEW FILIPINO HORSE. ; Four Troops of Macabebes to be Formed with Americans as Officers" Archived March 5, 2016, at the Wayback Machine , New York Times, July 17, 1900. 1 2 3 Dolan 1991. 1 2 "Otoy, Filipino bandit, slain by Constabulary". San Francisco Call. 110 (134). San Francisco. October 12, 1911. p. 5. ↑ Ileto 1997, pp. 193–197. ↑ Froles, Paul. "Macario Sakay: Tulisán or Patriot?". Philippine History Group of Los Angeles. Archived from the original on June 9, 2007. 1 2 Worcester 1914, pp. 392–395. ↑ Welman, Frans (2012). Face of the New Peoples Army of the Philippines: Volume Two Samar. Booksmango. p. 134. ISBN 978-616-222-163-7. ↑ Seekins, Donald M. (1991). "The First Phase of United States Rule, 1898–1935". In Dolan, Ronald E. (ed.). Philippines: A Country Study (4th ed.). Washington, D.C.: United States Library of Congress. ↑ Escalante 2007, pp. 223–224. ↑ Escalante 2007, p. 226. 1 2 3 4 "Act No. 926 (enacted October 7, 1903)". ChanRobles Virtual Law Library: Philippine Laws, Statutes & Codes. Manila: ChanRobles & Associates Law Firm. 2016. Retrieved December 25, 2016. ↑ "Act No. 1120 (enacted April 26, 1904)". ChanRobles Virtual Law Library: Philippine Laws, Statutes & Codes. Manila: ChanRobles & Associates Law Firm. 2016. Retrieved December 25, 2016. ↑ Escalante 2007, p. 218. 1 2 3 Escalante 2007, p. 219. ↑ "Thomasites: An army like no other". Government of the Philippines. October 12, 2003. Archived from the original on April 29, 2008. Retrieved December 25, 2016. 1 2 Escalante 2007, pp. 48–54. Emilio Aguinaldo y Famy was a Filipino revolutionary, politician, and military leader who is officially recognized as the first and the youngest President of the Philippines (1899–1901) and first president of a constitutional republic in Asia. He led Philippine forces first against Spain in the latter part of the Philippine Revolution (1896–1898), and then in the Spanish–American War (1898), and finally against the United States during the Philippine–American War (1899–1901). The Battle of Manila, sometimes called the Mock Battle of Manila, was a land engagement which took place in Manila on August 13, 1898, at the end of the Spanish–American War, four months after the decisive victory by Commodore Dewey's Asiatic Squadron at the Battle of Manila Bay. The belligerents were Spanish forces led by Governor-General of the Philippines Fermín Jáudenes, and American forces led by United States Army Brigadier General Wesley Merritt and United States Navy Commodore George Dewey. American forces were supported by units of the Philippine Revolutionary Army, led by Emilio Aguinaldo. The history of the Philippines from 1898 to 1946 began with the outbreak of the Spanish–American War in April 1898, when the Philippines was still part of the Spanish East Indies, and concluded when the United States formally recognised the independence of the Republic of the Philippines on July 4, 1946. The Pact of Biak-na-Bato, signed on December 14, 1897, created a truce between Spanish colonial Governor-General Fernando Primo de Rivera and the revolutionary leader Emilio Aguinaldo to end the Philippine Revolution. Aguinaldo and his fellow revolutionaries were given amnesty and monetary indemnity by the Spanish Government, in return for which the revolutionary government would go into exile in Hong Kong. Aguinaldo had decided to use the money to purchase advance firearms and ammunition later on return to the archipelago. The Schurman Commission also known as the First Philippine Commission was established by United States President William McKinley on January 20, 1899, and tasked to study the situation in the Philippines and make recommendations on how the U.S. should proceed after the sovereignty of the Philippines was ceded to the U.S. by Spain on December 10, 1898 following the Treaty of Paris of 1898. The term benevolent assimilation refers to a policy of the United States towards the Philippines as described in a proclamation by U.S. President William McKinley issued on December 21, 1898. It succinctly stated that "future control, disposition, and government of the Philippine islands were ceded to the United States" and that "the military government is to be to the whole of the ceded territory." The proclamation was issued after Spain was defeated in the Spanish–American War but before fighting began in the Philippine–American War. Prior to the proclamation, the United States had defeated Spain during the naval Battle of Manila Bay on May 1, 1898. Subsequently, on June 12, 1898, Emilio Aguinaldo declared the Philippines independent and established a revolutionary government whose the Filipino revolutionary armed forces surrounded Manila and the occupying American Army. This created a stand-off between opposing armies that would erupt in fighting in early 1899. The Sovereignty of the Philippines refers to the status of the Philippines as an independent nation. This article covers sovereignty transitions relating to the Philippines, with particular emphasis on the passing of sovereignty from Spain to the United States in the Treaty of Paris (1898), signed on December 10, 1898 to end the Spanish–American War. 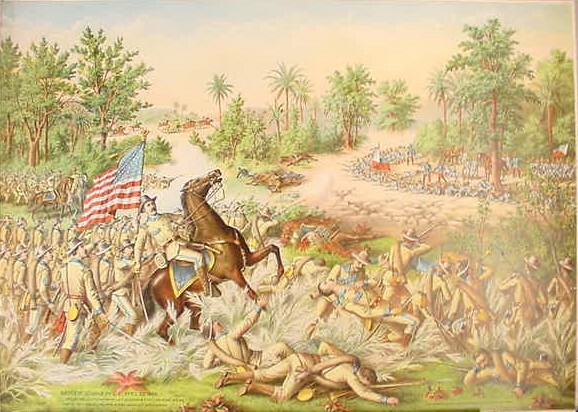 The Battle of Alapan was fought on May 28, 1898 and was the first military victory of Emilio Aguinaldo after his return to the Philippines from Hong Kong. After American naval victory of the Battle of Manila Bay, Aguinaldo returned from exile in Hong Kong, reconstituted the Philippine Revolutionary Army, and fought against a small garrison of Spanish troops in Alapan, Imus, Cavite. The battle lasted for five hours, from 10:00 A.M. to 3:00 P.M. The United States Military Government of the Philippine Islands was a military government in the Philippines established by the United States on August 14, 1898, two days after the capture of Manila, with General Merritt acting as military governor. 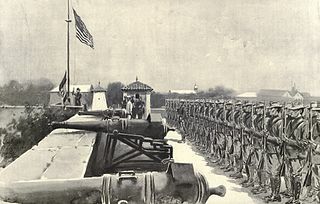 During military rule (1898–1902), the U.S. military commander governed the Philippines under the authority of the U.S. president as Commander-in-Chief of the United States Armed Forces. After the appointment of a civil Governor-General, the procedure developed that as parts of the country were pacified and placed firmly under American control, responsibility for the area would be passed to the civilian. 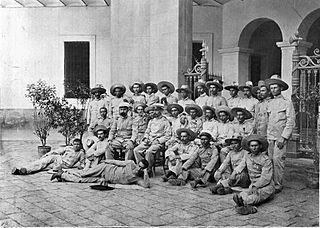 The Revolutionary Government of the Philippines was an insurgent government established in the Spanish East Indies on June 23, 1898, during the Spanish–American War, by Emilio Aguinaldo, its initial and only President. The government succeeded a dictatorial government which had been established by Aguinaldo on 18 June, and which was disestablished and replaced by this government upon its establishment. This government endured until January 23, 1899, when the proclamation of the Malolos Constitution established an insurgent Philippine Republic government which replaced it. The Dictatorial Government of the Philippines was an insurgent government in the Spanish East Indies inaugurated during the Spanish–American War by Emilio Aguinaldo in a public address on May 24, 1898 on his return to the Philippines from exile in Hong Kong, and formally established on June 18. The government was succeeded by a revolutionary government which was established by Aguinaldo on June 23. Arnold, James R. (2011). The Moro War: How America Battled a Muslim Insurgency in the Philippine Jungle, 1902-1913. New York City: Bloomsbury Publishing. ISBN 978-1-60819-365-3. Battjes, Mark E. (2011). Protecting, Isolating, and Controlling Behavior: Population and Resource Control Measures in Counterinsurgency Campaigns (PDF). United States Army Combined Arms Center, Fort Leavenworth, Kansas: Combat Studies Institute Press. ISBN 978-0-9837226-6-3. Bayor, Ronald H. (2004). The Columbia Documentary History of Race and Ethnicity in America. Columbia University Press. ISBN 0-231-11994-1. Birtle, Andrew J. (1998). U.S. Army counterinsurgency and contingency operations doctrine 1860–1941. Washington, D.C.: United States Government Publishing Office. ISBN 978-0-16-061324-1. Blitz, Amy (2000). The Contested State: American Foreign Policy and Regime Change in the Philippines. Rowman & Littlefield. ISBN 0-8476-9935-8. Boot, Max (2014). The Savage Wars of Peace: Small Wars And The Rise Of American Power (Revised ed.). New York City: Basic Books. ISBN 978-0-465-03866-4. Brands, Henry William (1992). Bound to Empire: The United States and the Philippines. Oxford: Oxford University Press. ISBN 0-19-507104-2. Brody, David (2010). Visualizing American Empire: Orientalism and Imperialism in the Philippines. Chicago: University of Chicago Press. ISBN 978-0226075341. Brooks, Van Wyck (1920). Ordeal of Mark Twain. E.P. Dutton & Company. Burdeos, Ray L. (2008). Filipinos in the U.S. Navy & Coast Guard During the Vietnam War. AuthorHouse. ISBN 978-1-4343-6141-7. Chambers, John W.; Anderson, Fred (1999). The Oxford Companion to American Military History. Oxford: Oxford University Press. ISBN 0-19-507198-0. Chapman, William (1988). Inside the Philippine revolution. I.B.Tauris. ISBN 978-1-85043-114-5. Coker, Kathy R. (1989). The Signal Corps and the U.S. Army Regimental System. U.S. Army Signal Center. Coker, Kathy R.; Stokes, Carol E. (1991). A Concise History of the U.S. Army Signal Corps. U.S. Army Signal Center. Halstead, Murat (1898). The Story of the Philippines and Our New Possessions, Including the Ladrones, Hawaii, Cuba and Porto Rico. Chicago: Our Possessions Publishing Company. Deady, Timothy K. (2005). "Lessons from a Successful Counterinsurgency: The Philippines, 1899–1902" (PDF). Parameters. Carlisle, Pennsylvania: United States Army War College. 35 (1): 53–68. Archived from the original (PDF) on December 10, 2016. Retrieved December 10, 2016. Dolan, Ronald E., ed. (1991). "United States Rule". Philippines: A Country Study. Washington, D.C.: United States Library of Congress. Escalante, Rene R. (2007). The Bearer of Pax Americana: The Philippine Career of William H. Taft 1900–1903. Quezon City: New Day Publishers. ISBN 978-971-10-1166-6. Feuer, A. B. (2002). America at War: The Philippines, 1898–1913. Santa Barbara, California: Greenwood Publishing Group. ISBN 0-275-96821-9. Francisco, Luzviminda; Jenkins, Shirley; Taruc, Luis; Constantino, Renato; et al. (1999). Schirmer, Daniel B.; Shalom, Stephen Rosskamm (eds.). The Philippines Reader: A History of Colonialism, Neocolonialism, Dictatorship, and Resistance. Brooklyn, New York: South End Press. ISBN 978-0896082755. Gates, John M. (1973). 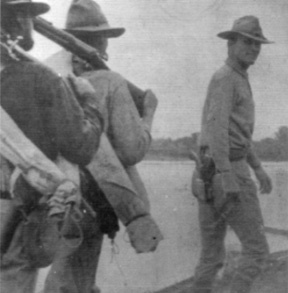 Schoolbooks and Krags: The United States Army in the Philippines, 1898–1902. Santa Barbara, California: Greenwood Publishing Group. ISBN 0-8371-5818-4. Gates, John M. (1983). War-Related Deaths in the Philippines, 1898–1902. Pacific Historical Review. 53. Gates, John M. (2002). The U.S. Army and Irregular Warfare (PDF). Wooster, Ohio: The College of Wooster. 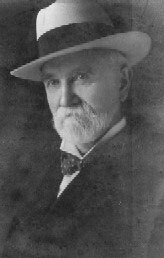 Giddings, Howard A. (1900). Exploits of the Signal Corps in the War With Spain. Hudson-Kimberly Publishing Co. pp. 15–16, 83. Golay, Frank Hindman (2004). Face of Empire: United States-Philippine Relations, 1898–1946. Quezon City: Ateneo de Manila University Press. ISBN 978-1881261179. Guevara, Sulpico, ed. (1972). The laws of the first Philippine Republic (the laws of Malolos) 1898–1899. Ann Arbor, Michigan: University of Michigan Library. Hack, Karl; Rettig, Tobias (2006). Colonial Armies in Southeast Asia (Routledge Studies in the Modern History of Asia). Abingdon-on-Thames, United Kingdom: Routledge. ISBN 978-0-415-33413-6. Hamilton, Richard F. (2007). President McKinley and America's "New Empire". Transaction Publishers. ISBN 978-0-7658-0383-2. Ileto, Reynaldo Clemeña (1997). Pasyon and revolution: popular movements in the Philippines, 1840–1910. Quezon City: Ateneo de Manila University Press. ISBN 978-9715502320. Jaycox, Faith (2005). The Progressive Era: Eyewitness History (Eyewitness History Series). New York City: Infobase Publishing. ISBN 978-0-8160-5159-5. Joaquin, Nicomedes (1977). A Question of Heroes. ISBN 971-27-1545-0. Kalaw, Maximo Manguiat (1927). The development of Philippine politics (1872-1920). Manila: Oriental Commercial Company, Inc.
Karnow, Stanley (1989). In Our Image: America's Empire in the Philippines. New York City: Random House. ISBN 978-030777543-6. Keenan, Jerry (2001). Encyclopedia of the Spanish–American & Philippine–American wars. Santa Barbara, California: ABC-CLIO. ISBN 978-1-57607-093-2. McLachlan, Grant (2012). Sparrow: A Chronicle of Defiance: The story of The Sparrows –Battle of Britain gunners who defended Timor as part of Sparrow Force during World War II. Klaut. ISBN 978-0-473-22623-7. Kumar, Amitava (1999). Poetics/Politics: Radical Aesthetics for the Classroom. Palgrave. ISBN 0-312-21866-4. Lacsamana, Leodivico Cruz (1990). Philippine History and Government (2nd ed.). Phoenix Publishing House, Inc. ISBN 971-06-1894-6. Linn, Brian McAllister (2000). 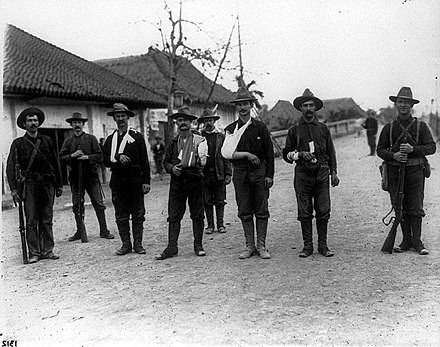 The U.S. Army and counterinsurgency in the Philippine war, 1899–1902. Chapel Hill: University of North Carolina Press. ISBN 978-0807849484. Lone, Stewart (2007). Daily Lives of Civilians in Wartime Asia: From the Taiping Rebellion to the Vietnam War. Santa Barbara, California: Greenwood Publishing Group. ISBN 978-0313336843. May, Glenn Anthony (1991). 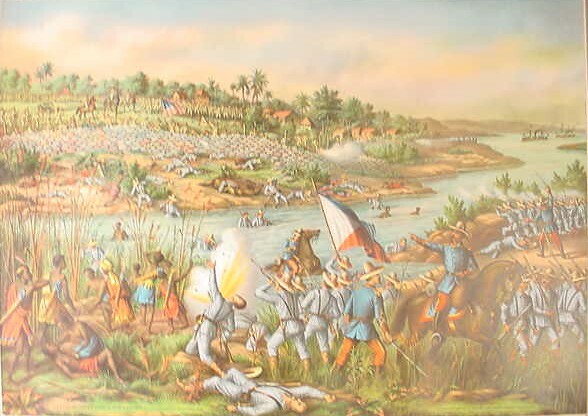 Battle for Batangas: A Philippine Province at War. New Haven, Connecticut: Yale University Press. ISBN 0-300-04850-5. Miller, Stuart Creighton (1982). Benevolent assimilation: the American conquest of the Philippines, 1899—1903. New Haven, Connecticut: Yale University Press. ISBN 0-300-03081-9. Minahan, James (2002). Encyclopedia of the Stateless Nations: L-R. Santa Barbara, California: Greenwood Publishing Group. ISBN 978-0-313-32111-5. Paine, Albert Bigelow (1912). Mark Twain: A Biography: The Personal and Literary Life of Samuel Langhorne Clemens. Harper & Brothers. Archived from the original on November 17, 2013. Painter, Nell Irvin (1989). Standing at Armageddon: The United States, 1877–1919. W. W. Norton & Company. ISBN 0-393-30588-0. "Race-Making and Colonial Violence in the U.S. Empire: The Philippine–American War as Race War," Diplomatic History, Vol. 30, No. 2 (April 2006), 169–210. (version [ permanent dead link ] at Japanfocus.org). Ramsey, Robert D. III (2007). Savage Wars of Peace: Case Studies of Pacification in the Philippines, 1900–1902 (PDF). United States Army Combined Arms Center, Fort Leavenworth, Kansas: Combat Studies Institute Press. ISBN 978-0-16-078950-2. Randolph, Carman Fitz (2009). "Chapter I, The Annexation of the Philippines". The Law and Policy of Annexation. Charleston, South Carolina: BiblioBazaar, LLC. ISBN 978-1-103-32481-1. Schirmer, Daniel B. (1972). Republic or Empire: American Resistance to the Philippine War. Schenkman. ISBN 0-87073-105-X. Schurman, Jacob Gould; Dewey, George; Denby, Charles Harvey; Worcester, Dean Conant (1900). Report of the Philippine Commission to the President. Volume I. Washington, D.C.: United States Government Publishing Office. Sexton, William Thaddeus (1939). Soldiers in the Sun. Charleston, South Carolina: Nabu Press. ISBN 978-1179372662. Shaw, Angel Velasco (2002). Vestiges of War: The Philippine–American War and the Aftermath of an Imperial Dream, 1899–1999. New York University Press. ISBN 0-8147-9791-1. Silbey, David J. (2008). A War of Frontier and Empire: The Philippine–American War, 1899–1902. Farrar, Straus and Giroux. ISBN 978-0-8090-9661-9. Simmons, Edwin Howard (2003). The United States Marines: a history (4th ed.). Annapolis, Maryland: Naval Institute Press. ISBN 978-1557508683. Storey, Moorfield; Codman, Julian (1902). Secretary Root's record. "Marked severities" in Philippine warfare. An analysis of the law and facts bearing on the action and utterances of President Roosevelt and Secretary Root. Boston: George H. Ellis Company. See also Moorfield Storey and Julian Codman (1902). Secretary Root's Record:"Marked Severities" in Philippine Warfare – Wikisource. Tucker, Spencer C., ed. (2009). The encyclopedia of the Spanish–American and Philippine–American wars: a political, social, and military history. Volumes I-III. Santa Barbara, California: ABC-CLIO. ISBN 978-1-85109-951-1. Wildman, Edwin (1901). Aguinaldo: A Narrative of Filipino Ambitions (PDF). Norwood, Massachusetts: Norwood Press. Wolff, Leon (1960). Little Brown Brother: How the United States Purchased and Pacified the Philippine Islands at the Century's Turn. Doubleday & Company, Inc. Library of Congress Catalog Card Number 61-6528. Wolters, Willem G. (2004). Gin, Ooi Keat (ed.). Southeast Asia: A historical encyclopedia, from Angkor Wat to East Timor. II. Santa Barbara, California: ABC-CLIO. ISBN 1-57607-770-5. Worcester, Dean Conant (1914). The Philippines: Past and Present. Volume I. New York: Macmillan Publishers. Worcester, Dean Conant (1914). The Philippines: Past and Present. Volume II. New York: Macmillan Publishers. Young, Kenneth Ray (1994). The General's General: The Life and Times of Arthur Macarthur. Boulder, Colorado: Westview Press. Zwick, Jim (1992). Mark Twain's Weapons of Satire: Anti-Imperialist Writings on the Philippine–American War. Syracuse University Press. ISBN 0-8156-0268-5. Zwick, Jim. Friends of the Filipino People Bulletin. Zwick, Jim (1982). Militarism and Repression in the Philippines. Centre for Developing-Area Studies, McGill University. ISBN 0-88819-054-9. Zwick, Jim (1992). Prodigally Endowed with Sympathy for the Cause: Mark Twain's Involvement with the Anti-Imperialist League. Ephemera Society of America. ASIN B0006R8RJ8. Zinn, Howard (2003). A People's History of the United States . New York City: The New Press. ISBN 978-1-56584-826-9. Delmendo, Sharon (2004). The star-entangled banner: one hundred years of America in the Philippines. New Brunswick, New Jersey: Rutgers University Press. ISBN 0-8135-3411-9. Jacobson, Matthew Frye (2000). Barbarian virtues: the United States encounters foreign peoples at home and abroad, 1876–1917. New York City: Hill & Wang. ISBN 978-0-8090-1628-0. Jones, Gregg (2012). Honor in the Dust Theodore Roosevelt, War in the Philippines, and the Rise and Fall of America's Imperial Dream. New York City: New American Library. ISBN 978-0-451-22904-5. Stratemeyer, Edward. (1898). Under Dewey at Manila – Wikisource. Stratemeyer, Edward (as Ralph Bonehill). (1899). A Sailor Boy with Dewey – Wikisource. Stratemeyer, Edward. (1900). The Campaign of the Jungle – Wikisource. Stratemeyer, Edward. (1901). Under MacArthur in Luzon – Wikisource. The "Lodge Committee" (a.k.a. Philippine Investigating Committee) hearings and a great deal of documentation were published in three volumes (3000 pages) as S. Doc. 331, 57th Cong., 1st Session An abridged version of the oral testimony can be found in: American Imperialism and the Philippine Insurrection: Testimony Taken from Hearings on Affairs in the Philippine Islands before the Senate Committee on the Philippines—1902; edited by Henry F Graff; Publisher: Little, Brown; 1969. Wikimedia Commons has media related to Philippine-American War . Philippine Centennial Celebration [ permanent dead link ] MSC Computer Training Center. 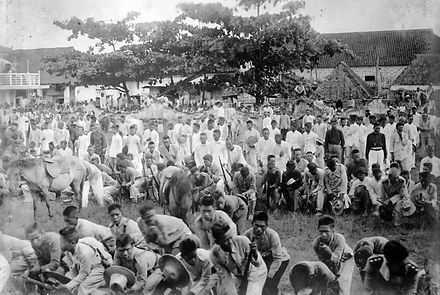 The Philippine Revolutionary Records at Filipiniana.net (archived on 2009-05-25). Booknotes interview with Stanley Karnow on In Our Image: America's Empire in the Philippines, May 28, 1989. No. 15 Spanish 12-pounder Photo of a bronze cannon captured by the Americans in Manila.